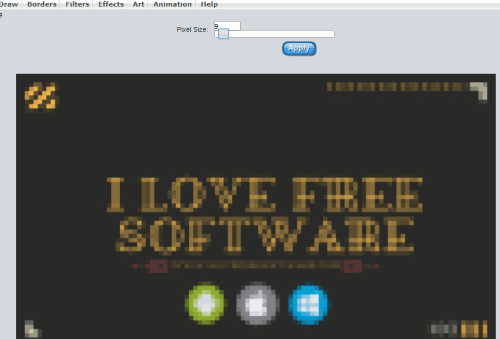 Here are 4 free online picture to pixel art converter websites. When you want to pixelate some image stored on your PC, these websites will be very helpful. All these online picture to pixel art converters support common image formats like PNG, JPG, BMP, etc. Each website automatically turns uploaded picture to pixel art with default pixel size. However, you have the choice to set pixel size or block size so that the output looks good and come as per your expectations. Some of these websites also come with the feature to preview input and output pixel art image for better understanding. Let’s check these free online picture to pixel art converters one by one. LunaPic is a feature-rich online image editor which comes with picture to pixel art feature. This feature is simple yet very useful. You can add URL of an online image or upload image from PC and then it will convert it to pixel art automatically. By default, it converts the picture to pixel art with 5-pixel size. But, you have the choice to increase decrease pixel size by just moving a slider. As you move the slider, it shows output pixel art preview. This helps to get a better idea how the output is looking. When you are satisfied with the output, you can apply the changes and then save pixel art to PC with just one click. It also lets you share the output pixel art to your Facebook, Tumblr, Twitter, Pinterest, and other supported accounts. As I already mentioned in starting, this is a feature-rich image editor. So, you can also use it to crop, rotate images, add filters, remove objects from photo, borders, and more. Pixelate Effect Online is another interesting website to convert an image to pixel art. This online photo to pixel art converter provides feature similar to LunaPic. That means, you can upload an image from PC and then set block size using a slider to generate the pixel art image. What makes it better than LunaPic and other similar sites is you can preview input image and output pixel art side by side. Another great feature is the output pixel art image can be saved as Webp, JPG, and PNG images. Converting a picture to pixel art is also pretty simple. 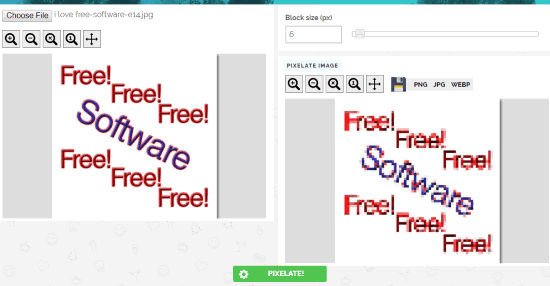 Add an image from PC, preview it (including zoom in and out options), set block size or pixel size, and use PIXELATE! button to preview the output. After that, save the output to any of the available formats. Inettools.com comes with a handy picture to pixel art converter feature. Like other image to pixel art converter websites covered on this list, it also lets you set the pixel size value between 0 to 100. Set the pixel size and then output preview is visible. If it looks good, then you can save the pixel art to PC. Otherwise, you can set some other value and check the output. What makes it more useful is you can upload multiple images from PC on this website. After that, you need to select an uploaded image and then convert it to pixel art. 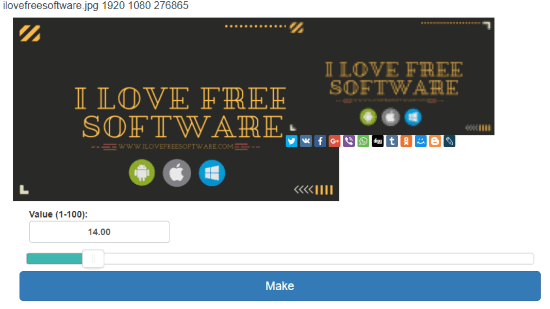 You can also delete an uploaded image from this website using the Delete icon. IMGonline.com is handy to turn picture to 8-bit pixellated picture. Apart from that, it also comes with options to set the size of pixels (0-100) and dithering level (between 0 to 100). Higher the size of pixels and dithering level, more the image will be pixelated. Apart from these features, it also lets you set output format as JPG or PNG. 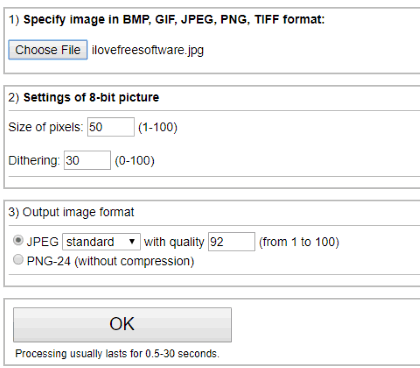 If you have selected output as JPG image, then you can also set the JPG image quality. This website doesn’t let you preview the input image and output pixel art but you can view output pixel art online before saving it to PC. If the output is not good, you can go back and adjust settings to generate the pixel art from the input image. These are my best picked online picture to pixel art converter websites. All are quite good. Still, I find first two websites better than others because you can easily preview the output pixel art before downloading it to PC. Among “LunaPic” and “Pixelate Effect Online”, the second website is better than LunaPic because it supports three different output formats.